On a hunt for a simple and easy way to enjoy lunch at the office? 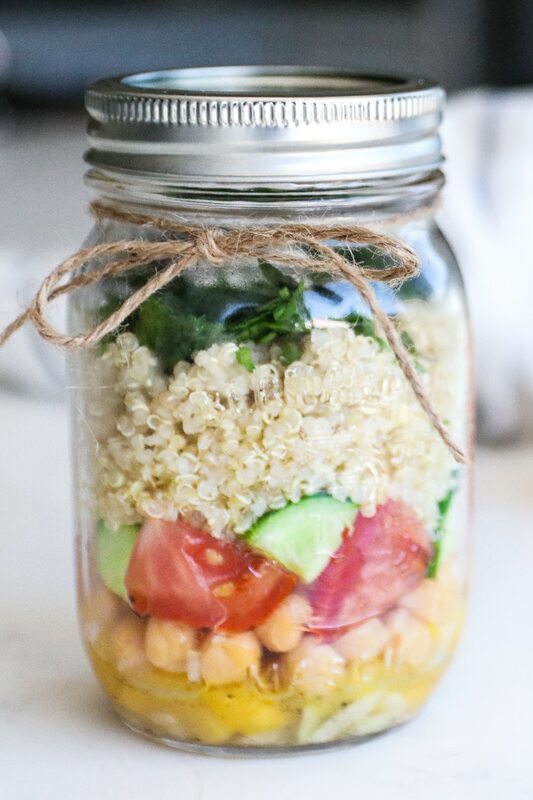 Try this gluten free, low GI and portable Mediterranean Quinoa Chickpea Salad in a jar. It’s delicious, nourishing and oh so satisfying – minus the sogginess! I’m always on the hunt for nourishing lunch ideas, that I can prep ahead of time and take to work. 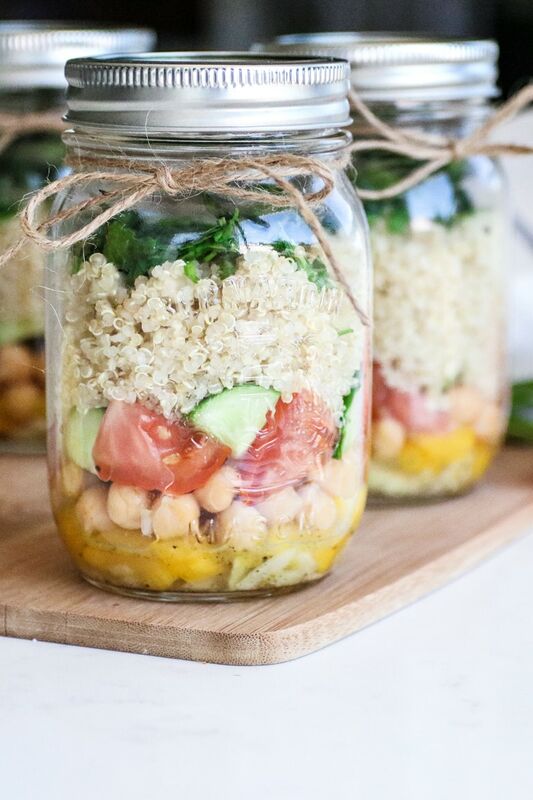 This trick of using mason jars, to make delicious and simple salads has been my new obsession. 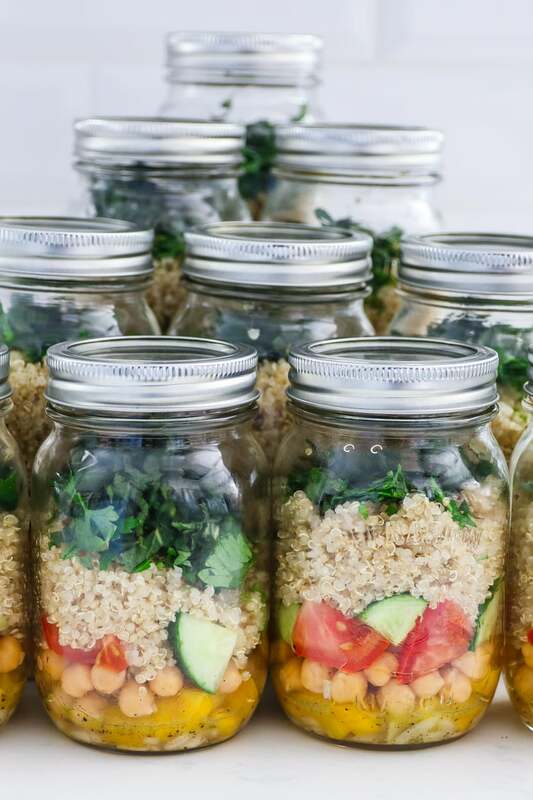 The jars are the perfect size for one portion and a creative and simple way to get in more veggies. This recipe was inspired by my quinoa moong bean salad recipe that so many of you loved. You probably know by now, how much we *heart* quinoa; it’s a staple in my kitchen, and shows up in cold and hot dishes. Yay for quinoa; it’s so versatile. It’s one of those foods, that can either be spectacularly flavorful or bland. If you’re used to the latter, then you need to keep reading on, and learn how to make quinoa taste better. Trust me, you don’t want to miss out. For this recipe, I’ve mixed things up – to bring new ingredients, and a burst of flavor, because lunch should never be boring. And all the fun in mason jars – delightful and creative. Quinoa has been around forever. It has gained considerable traction recently, for being a superfood. Not only this, the UN, declared 2013 as the “year of quinoa”, because of its important role in eradication of hunger, poverty and malnutrition. Quinoa is easy to cultivate, and has a great nutritional profile. Not surprising then, that it won this accolade. Did you know that 1 cup of quinoa has 8-9 g of protein – the same amount as one cup of whole milk. Regarded to be a complete protein, quinoa has all 9 essential amino acids (building blocks of protein), that your body needs. I think you’d agree that it’s a great plant based source of protein. As someone who struggles to digest gluten, I rely heavily on quinoa – it’s a life-saver! When I discovered I couldn’t handle gluten too well, and began to omit it from my diet, I would worry that I’d be compromising on important nutrients, like fiber. I had my eyes set on finding recipes that were nutritionally balanced – with ingredients I could tolerate. Both quinoa and chickpeas offer loads of fiber; insoluble fiber, found in the quinoa, helps to keep you regular and has shown to help reduce the risk of diabetes. Chickpeas, on the other hand, contain both soluble and non-soluble fiber. Soluble fiber helps to control your blood sugar and cholesterol levels. Women aged 19-50 years should aim to get at least 25 g of fiber daily. Remember, you want to increase the amount of fiber in your diet slowly. Increasing your level of physical activity and drinking plenty of water will help to prevent symptoms of gas and bloating. In a medium pot, combine the quinoa with water and bring to boil. Once the water starts to boil, turn the heat down to a low, simmer and cover the pot. Cook the quinoa for until tender. Once the quinoa is cooked, drain and transfer to a large bowl. Set aside to cool. 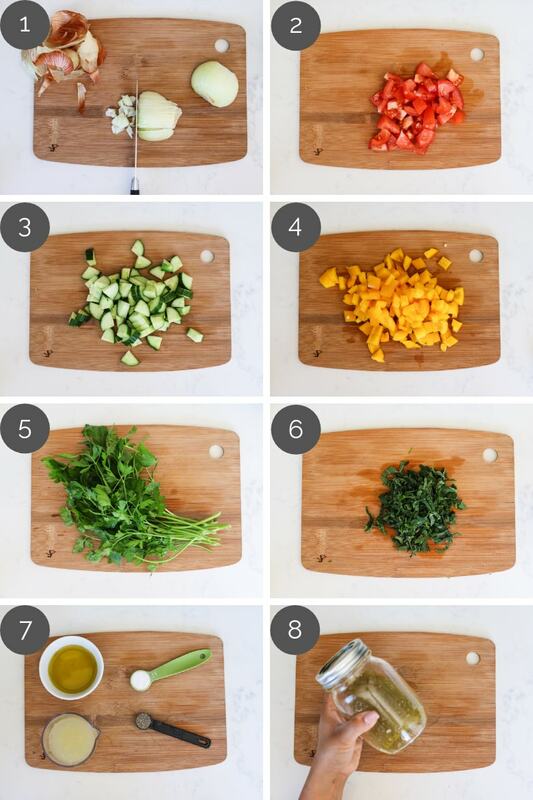 The next few layers should be your sturdy ingredients, like your cucumber, tomato, and peppers, along with the chickpeas. Have you tried salad in a jar? If you try this recipe, would love to hear from you! Leave a comment, rate it, or share a photo and hashtag with #desiliciousrd on Instagram and twitter! Can’t wait to see your photos. On a hunt for a simple and easy way to enjoy lunch at the office? 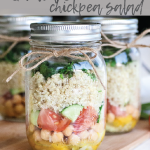 Try this gluten free, low GI and portable Mediterranean Quinoa Chickpea Salad in a jar. It’s delicious, nourishing and oh so satisfying - minus the sogginess! In a medium pot, combine 2 cups of quinoa with 4 cups of water and bring to boil. Once the water starts to boil, turn the heat down to low, simmer and cover the pot. Cook the quinoa for 10-12 minutes or until tender. Once the quinoa is cooked, drain and transfer to a large bowl. Set aside to cool. 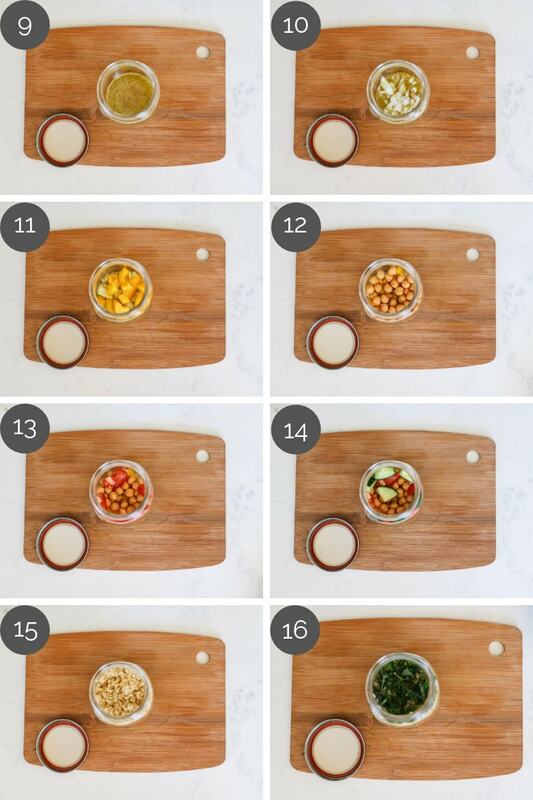 The next few layers should be your sturdy ingredients, like your cucumber, tomato and peppers, along with the chickpeas.